When you first think of a rain forest, the thought that comes to mind is a steamy, bug infested jungle along the equator. But not all rain forests are hot and humid. The Pacific northwest of the United States has North Cascades National Park in Washington. New Zealand, Australia, Great Britain, Chile and several other countries all support a temperate rain forest within their borders. The highest mountain tops in Georgia, North Carolina and Tennessee create a unique climate by forcing cloud formations up their slopes until they cool, condense and disburse their precipitation, creating damp, rainy conditions. Join us as we explore the unique flora and fauna of these Appalachian rain forests. We depart at 7:30 AM from Plant City where you can leave your vehicle in a secure, fenced and locked location. Our first stop is in Ocala, FL to pick up additional travelers before continuing on to Valdosta for lunch at Jessie's Eats where the grilled pimento cheese is to-die-for. Relax and meet your fellow travelers while our driver mans the controls. Our final resting place for the day is the Holiday Inn Express in Helen, GA, just outside Brasstown Bald. After check-in, take a walk along the lovely, shady Chattahoochee river, the city park, downtown or the hiking trail that heads off into the woods. All are just a few steps from your hotel door. At 4,784 ft above sea level, Brasstown Bald is the highest elevation in Georgia and is operated by the Cradle of Forestry under permit from the US Forest Service. The shuttle takes up to the visitor center at the summit where we meet our local, native plant guides, split into two groups and head out on the trails. Choose how far you want to hike by the group you join. Everything is down hill from here. The Wagon Train Trail eventually ends at Young Harris College in the town of Young Harris, 7 miles away where every year the recent graduates and their families start their hike to the top to celebrate. Just outside Helen, lies the cool, serene falls of Anna Ruby, named after the local homesteader's beloved, only daughter following the death of his wife and sons. Two creeks merge at the bottom of the falls, Curtis Creek dropping 153 ft and York Creek falls 50 ft to form the twin falls. From the falls, Smith Creek tumbles 550 miles, eventually joining the Appalachicola River in Florida and ending its journey in the gulf of Mexico. The lower falls (pictured here) are just a precursor for the main falls as you follow the footpath to the top. Vegetation along the trail is relatively untrammeled and provides a good opportunity to see rocky streamside, acidic cove and rich cove communities up close, plus the falls have spray cliffs which can be seen from a safe distance. At 6,684 ft, Mt Mitchell is the highest point in North Carolina and eastern North America. The mountain's summit consists primarily of two evergreen species - the Red Spruce and the Fraser Fir. Most of the mature Fraser Firs have died from the non-native Balsam woolly adelgid, but young fir and spruce trees do well in the subalpine climate along with wild blueberries and blackberry shrubs. The Fraser Fir is only native to the Appalachians and is a relic of the last ice age, having retreated to the mountain tops as the earth warmed. The spruce/fir forests are similar to the boreal forests of Canada. We have two naturalists guiding our group as we tour two different trails and learn about the native flora, mosses, lichens and how they survive in such a harsh environment. On the way back to Sylva, we swing through Asheville's vibrant downtown for dinner and shopping. Our lunch stop before exploring the mountain is the Mt Mitchell Restaurant, run by Ryan and Samantha "Sam" Spears. With beautiful views of the surrounding woods, on a clear day you can almost see forever. The rustic stone building blends beautifully with the surrounding forest. At 6,643 ft, Clingmans Dome is the highest point in Tennessee and has also experienced a large die-off of Fraser Fir, the result of the Balsam woolly adelgid. We will find out what the next succession forest might look like. Originally called Smoky Dome, the name was changed to honor Thomas Lanier Clingman, US Senator and Confederate General who accurately measured the peak with a barometer. The peak is often shrouded in fog and receives 84 inches of rain each year yet the temperature has never been recorded over 80 degrees. 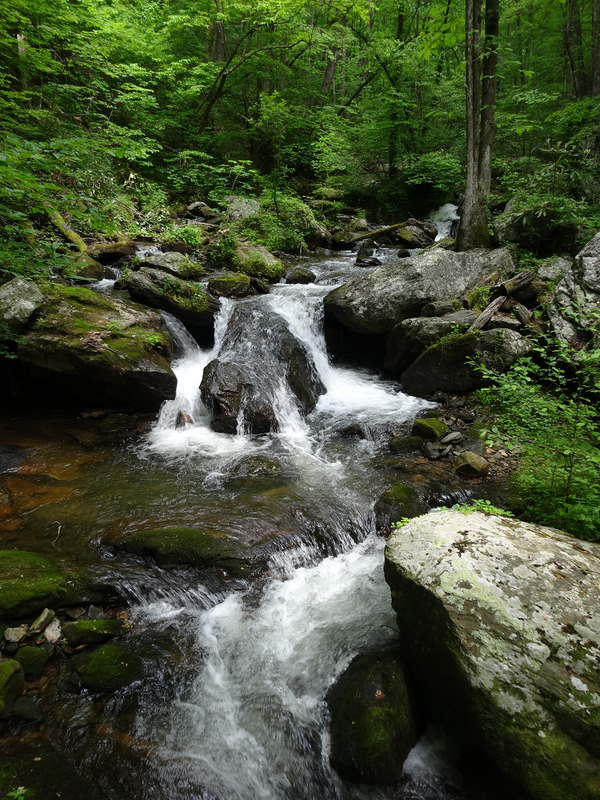 The two naturalists guiding this hike will take us out to Andrews Bald, an incredible mountain-top meadow, and along the Spruce-Fir Nature Trail. Along with touring the summit of Clingmans Dome our group will explore the Mingus Mill area with a specialist on the Eastern Band of the Cherokee Indians that will help us discover some of the plants utilized by the native Americans and the uses these native plants provided, from food to medicine to tools. As we head back south, we'll stop in Clayton, GA, a quaint, small town with lovely shops and cafes. Some of the best pizza around comes from this local cafe on main street Clayton. Fortify Pi offers everything from Lamb pizza to Filet Mignon to the Veggie (my favorite). The town of Tallulah Falls goes back to the 1880's as a mecca for tourists seeking respite from the city and heat of summer. Once the site of nearly 20 hotels and boarding houses, the town now has just 168 people (at the 2010 census). Helen Dortch Longstreet started one of the first conservation efforts in Georgia in 1911 when she lobbied the state legislature to oppose construction of the dam by Georgia Power. Today, the Georgia Department of Natural Resources and Georgia Power Company jointly operate the gorge. Our guides, Mincy Moffett and Carrie Radcliffe will lend their expertise to our tour.